From the mid-1800s through the early 20th Century, the Industrial Age reached farms in the form of steam traction engines. While they were heavy and slow, they were preferred for their serious hauling capabilities. 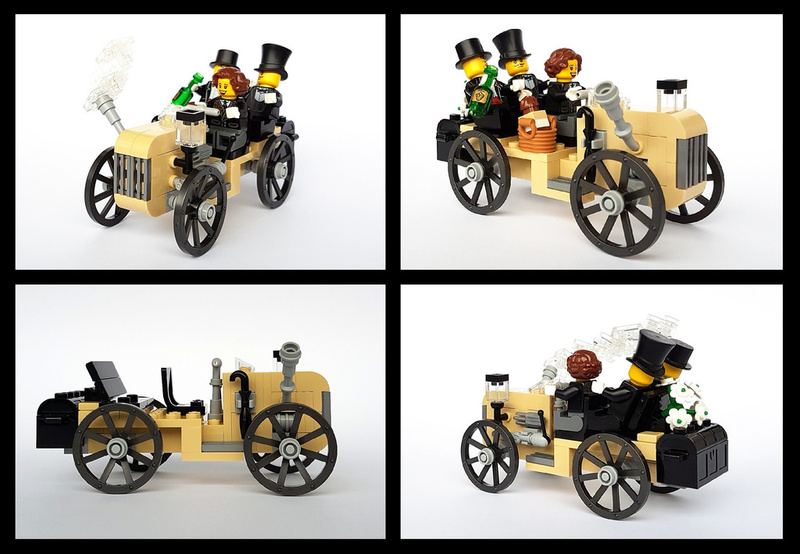 There is something captivating about these massive mechanical marvels, and that’s probably why Nikolaus Löwe built a fleet of three steam traction engines. Each one looks distinct enough to stand on its own. 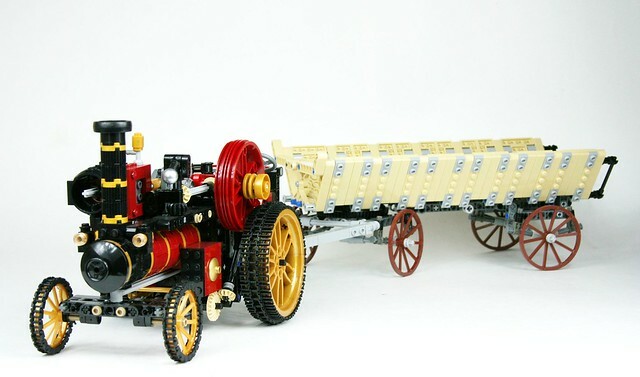 My favorite model is this traction engine, which is hauling a hay wagon. The vehicle’s color scheme is eye-pleasing, rendered in dark red, black, and gold. Meanwhile, the black chain links look great wrapped around the wheels. 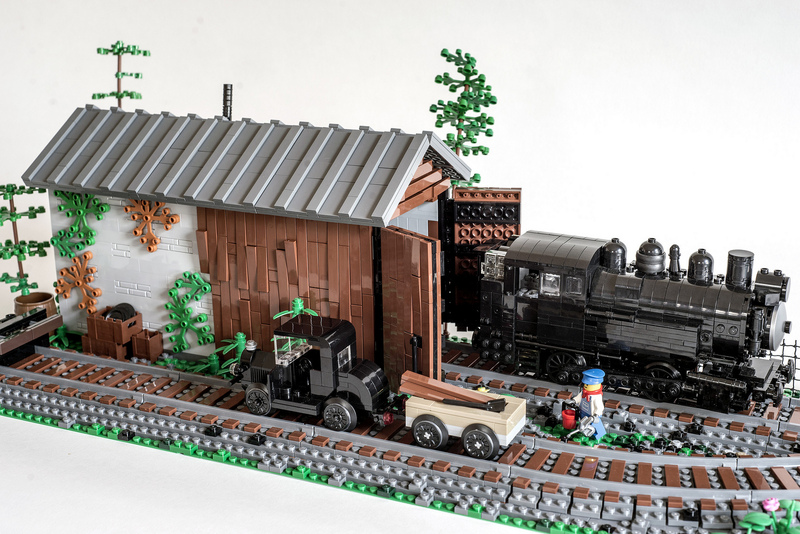 I’m a sucker for history and trains, and Rob Winner delivers on both counts with this slice of the Illinois Midland Railway in LEGO-form. According to the builder, the real line was only 1.9 miles long. This was in large part because of a crooked businessman making big promises and running off with the community of Newark’s money. Regardless, the little town made use of the railway to connect with nearby Millington. Rob’s model is meant to represent the railway during the 1940s, back when World War I veteran William Thorsen was running the show. Thorsen is depicted with the vehicles he operated, including a Vulcan 0-4-0T steam engine and Ford Model T railway inspection car. The engine shed plays its part well, looking weathered and forgotten. Rob pulled this off by adding vines and slightly tilting brown plates outward to simulate loosened wooden boards. It’s a stark contrast to Thorsen standing among railway equipment that looks well taken care of. Then again, he is their devoted caretaker! This juxtaposition is inspiring, symbolizing the fight to persevere against all odds. Full steam ahead on the farm! 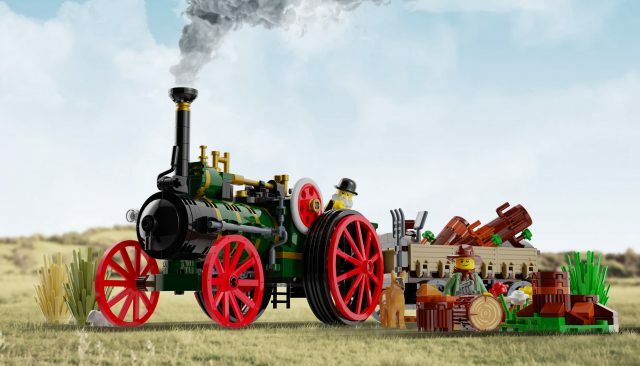 Steam traction engines first appeared on farms in the 1850s, and they were massive vehicles used for everything from hauling implements to powering belt-driven equipment. Use of these vehicles declined with the rise of the internal combustion engine, but their legacy lives on in the form of modern farm tractors. 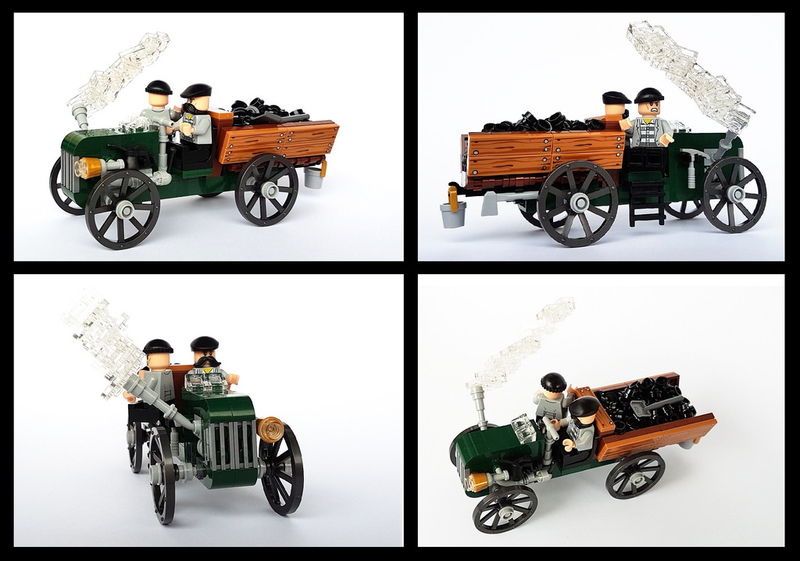 Thanks to builders like Bricked1980, their legacy also lives on in LEGO form! Bricked1980 does a really good job of capturing the look and feel of the vehicle, along with providing a rendered background that feels like an agricultural field. The color scheme is pleasing to the eye, consisting of a black boiler, green body and brass accents. Bright red wheels add a splash excitement. It’s worth noting that Bricked1980’s model is a digital render and, as such, it features some parts in non-production colors. However, it presents a sharp looking image with an equally great looking model. 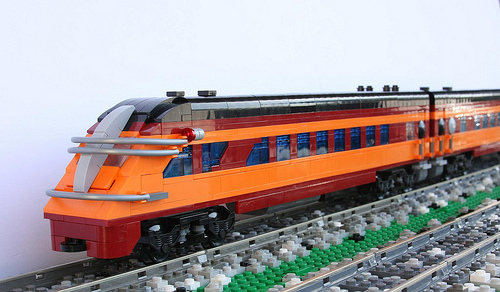 Fancy a train trip to New Jersey? Make sure you have your ticket booked as the iconic Blue Comet by Cale Leiphart is arriving! 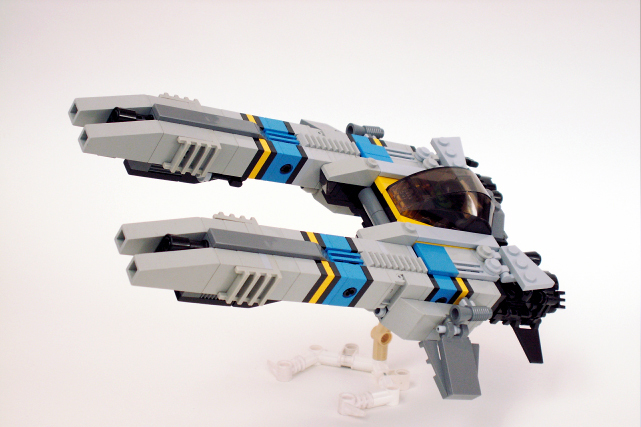 Its thoroughly designed body measures more than 40 studs in length and features a ton of the tiniest elements: valves, sand and steam domes, levers and regulators — all in blue, which makes this build a remarkable assembly of LEGO parts in regular blue color. 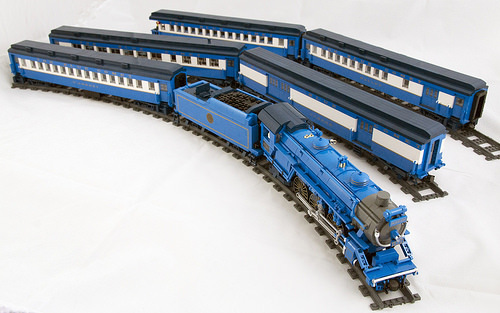 And it wouldn’t be a proper locomotive without a full set of carriages. As usual, Flick album has all the details of this impressive train. I’m always pleased when Tony Sava (sava_the_aggie) posts pictures of one of his trains in situ. He’s got a camera with a great depth of field, and a great skill at using it. I’ve got a little time this evening so figured I might as well post some old things from my bloglist. First up is Caleb Randolph’s Swedish Class B. As though packing in the details wasn’t enough, Caleb has gone where others fear tread and added sound. As for the model itself: I’m particularly impressed by the running gear (the bars that move hypnotically on the wheels) as it’s nice and thin. Secondly there is Cale Leiphart’s “K4s”. This pair of beauties are SNOTtastic in their details, in particular using panels to obtain a nice thin board next to the boiler (the big round bit). And last but not least is Peter Norman’s (swoofty) Hiawatha Beaver tail wagon. In case you’ve never noticed I do like me some streamline moderne design. Those of us who are into trains know that Anthony Sava has been working on his Pennsylvania Railroad T1 Duplex (4-4-4-4) Steam Engine #5544 for a year and a half. We know this because Tony has been posting work-in-progress pictures, asking for advice and generally running an interactive development system for all this time. Since many people seemed to enjoy my Anatomy of a Warehouse post where I went through some of my own building stages I think this post should appeal even more. Anthony has documented about 30 images as he has progressed in this project. Right at the beginning he asked for advice and suggestions on the nose which elicited many responses. As one of the most prominent features of the train it is really important to get this right and I think Tony achieved this admirably in his final version. Later on Tony used LDraw to mock up various components of the train. I assure you the vanity of the example selection was accidental. As the train got nearer to completion (this picture is four weeks old as of today) the design began to settle down (note the differences from the CAD image above) and more refined details started to appear. A final pre-production version was completed a few days ago. Just lacking the stickers and any final tweaks. Tony thanks many people for their help but I’d like to thank him for spending the time on this excellent creation. And I think we can all agree this train has aged rather well since its inception. 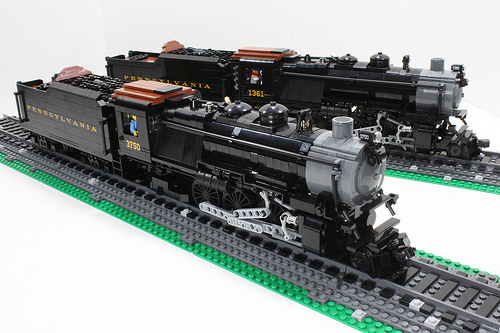 Making big LEGO steam engines that run is hard work. 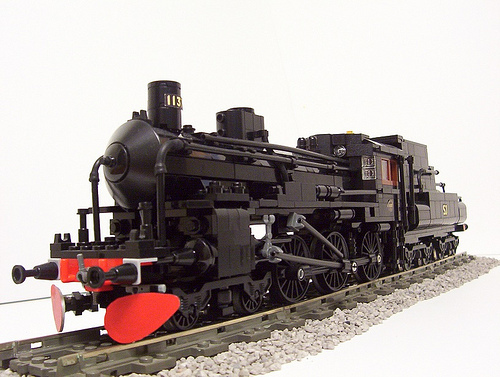 LEGO train track has very sharp curves which mean all sorts of clever trickery is required to make a steam train even get around it without looking totally stupid. Fortunately Cale Leiphart is quite an expert in it and shows off a lovely 4-4-0 locomotive (that’s eight wheels) from the Maryland & Pennsylvania railway. 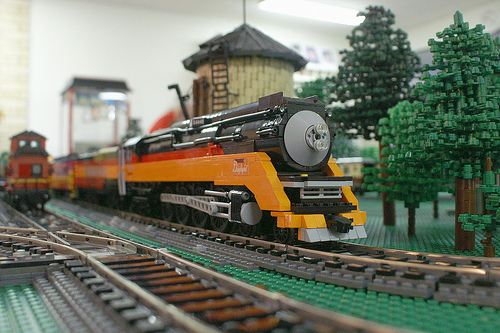 The presentation in front of the Twin Cities LEGO Train Club’s layout is pretty snazzy too.